These amazing treats taste like a key lime pie in s'mores sandwich form. The marshmallows are lightly charred and melted on graham crackers. The crackers are cooled slightly, and then sandwiched with rich, tart key lime curd. Use the included recipe for homemade key lime curd or your favorite store-bought brand. You'll probably have plenty of key lime curd left over. Use as a dip for berries or fruit slices, or serve it as a spread for shortbread cookies, scones, or biscuits. Place a fine mesh strainer over a stainless steel or glass bowl. In a medium saucepan over medium-low heat, melt the butter. Remove the saucepan from the heat and add the sugar, and lime juice; whisk to blend. Whisk in the egg yolks until the mixture is smooth. Place the saucepan back on the heat and cook while whisking constantly until the mixture reaches about 180 F to 190 F on an instant-read thermometer, or until it coats the back of a spoon. To test with a spoon, dip a metal or wooden spoon into the custard. Take it out and draw your finger over the back of the spoon through the custard film to make a path. If the path remains clear and doesn't fill in, the custard is done. Do not let the mixture boil. It will thicken as it cools. Pour the hot custard mixture through the mesh strainer. Discard the solids left behind in the strainer. Stir the finely grated lime zest into the mixture, if using. Place a sheet of plastic wrap directly onto the surface of the custard to prevent a skin from forming. Refrigerate for 3 to 4 hours, or until thoroughly chilled. Arrange 12 graham cracker squares on a large rimmed baking sheet. If desired, char the marshmallows slightly on a skewer over a gas burner or with a kitchen brulee torch. Place a marshmallow on each graham cracker square. Bake for 5 to 7 minutes, or until they are puffed and very soft. Meanwhile, arrange the remaining graham crackers on another baking sheet. Spoon about 1 tablespoon of chilled key lime curd onto each square. Put the baking sheet in the freezer for about 5 minutes, or until very cold and firm. Or refrigerate until well chilled. When the marshmallow-topped graham crackers come out of the oven, tamp the soft marshmallows down slightly to cover the cracker. Let them cool slightly and then invert a chilled lime curd-topped graham cracker onto each one. Serve at once. 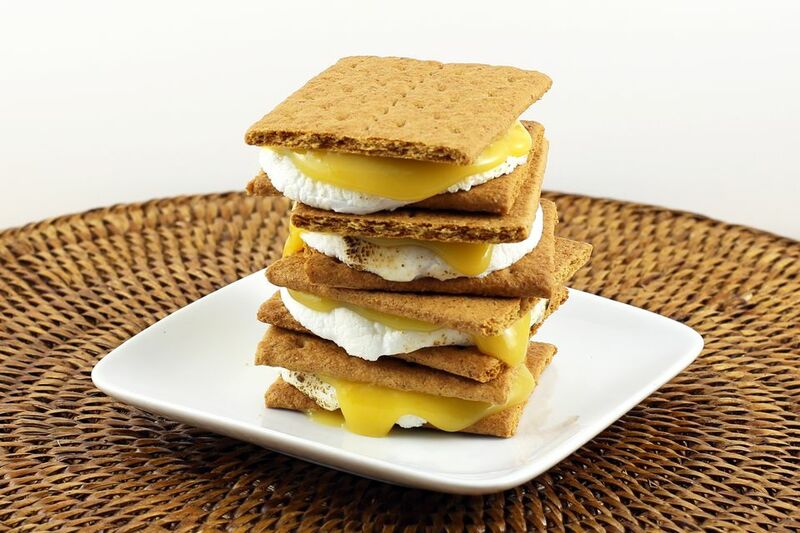 Make lemon meringue s'mores with purchased or homemade lemon curd.